1925 – Pledged $6,500 to furnish Maternity Department at Butterworth Hospital. 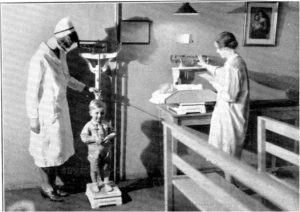 1927 – Members volunteered 559 hours to Clinic for Infant Feeding. 1928 – Established part-pay maternity plan at Butterworth Hospital to permit mothers to enter the hospital on a part-pay basis to reduce the maternal and child death rate in Grand Rapids. Project continued until 1941 and benefited 1279 mothers at a cost to the League of $30,711. 1932-33 – Started work at Art Gallery giving educational talks in Grand Rapids Public Schools reaching approximately 3,000 children in 21 schools. 1945-46 – Jointly sponsored radio program with Friends of American Art and the Grand Rapids Public Library – “Books Bring Adventure” – broadcast on WLAV every Saturday afternoon for 13 weeks. Number of children who listened regularly – 2,594. 1946-47 – Art Program for Children started– 5th and 6th grade children attended art talks at the Art Gallery. 1946 – Started Cerebral Palsy Nursery School in the basement of Mary Free Bed Hospital for children ages 3-7. The League turned the Nursery School over to the Grand Rapids Public Schools in 1951. 1962 – Purchased a bus for the Grand Rapids Public Museum to transport students to and from the museum for tours. That year we also established a volunteer guide and lecture program for the museum. 1967 – Gave a $10,000 grant to Goodwill over 3 yrs in 1967. 1970 – Provided lead funding with Grand Rapids Foundation for inaugural Festival. 1970 – Assisted in planning and implementing an educational program at Blandford Nature Center and provided $6,000 in support. 1972 – Sponsored four six-week courses on racism. 1973 – Active member organization of the West Michigan Environmental Action Council. 35 League members were involved in WMEAC and we provided $7,000 over three years. 1975– Bargain Bonanza raised record $41,500. Funds were used for the John Ball Park Zoo docent program. League organized a tour training course and educational materials for tours which turned into a volunteer arm of the zoo called “Zoo Doers”. 1976 – 1st edition of Cookbook printed (total of 5 printings and 57,000 copies) and debuted at June 1976 luncheon with sustainer Betty Ford in attendance. 1977– Neighborhood Drop In Center project geared toward single parent families for infants to preschool. Offered childcare and time for parents to meet other parents. League donated $25,000 for project. 1978 – Donated $21,000 to Battered Women Coalition at YWCA. Fourteen members worked with victims. 1978 – Donated $20,000 to the Women’s Resource Center. 1981 – Kids on the Block – presented puppet shows to help integrate disabled children into the classroom. 1985 – Blandford Nature Center – League committed $7,800 over 3 years to pay for a part-time volunteer coordinator. In addition, about 10 League volunteers trained others in Blandford’s nature program. 1986 – Funded arts festival for the disabled $18,500 (Very Special Arts). Concept was to demonstrate impact of the arts in developing artistic responsiveness and learning among disabled students. 1988-89– Provided $24,000 in funding for Ronald McDonald House over three years. League had about 30 volunteers per year involved in various committees. 1988-89– League gave $16,000 to Habitat for Humanity over two years. 1988 – Adolescent Pregnancy Watch – program to prevent unplanned pregnancies among teen girls. 1992 – CASA Children’s Voice in Kent County (Court Appointed Special Advocate). Appointed by a judge to research and speak up for best interest of the child. Healthy Start (early support in parenting years received $13,000 from the League). 1996-97 – Explore with Reading – literacy project in collaboration with the Grand Rapids Public Schools. 2006 – Kids in the Kitchen engages children in the preparation of healthy meals and educates them and their parents regarding nutrition and healthy choices. 2011-14– Junior League Wellness Adventure Yard – raised funds and constructed a $140,000 playground with specialized equipment for children at the YWCA Domestic Crisis Center, now called the YWCA Wege Sojourner House.